If you’ve loved your first tandem skydive so much that you just have to do it again – congratulations! You have officially started down the path to learn to skydive that will take you from tandem student to “A” licensed skydiver. You’re also in luck: WNY Skydiving is the premier skydiving training center of Western New York and we provide a comprehensive, reasonably-priced program to get you flying solo. 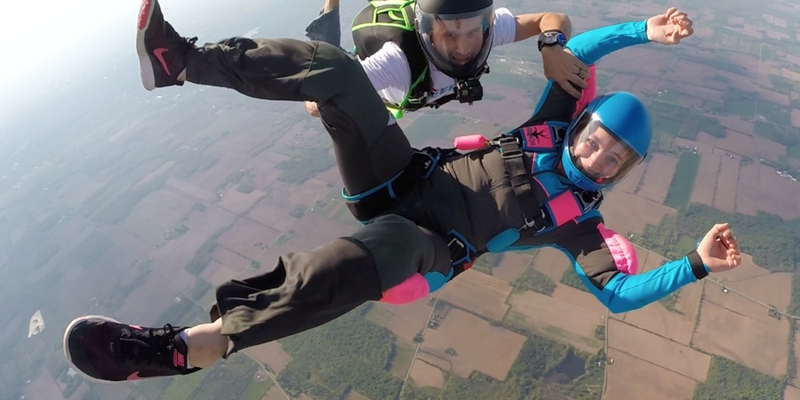 As a Group Member of the United States Parachute Association (USPA), WNY Skydiving follows the Integrated Student Program (ISP). The ISP is an approved skydiving training program recognized around the world. This program is outlined in the Skydiver’s Information Manual, published by the USPA. 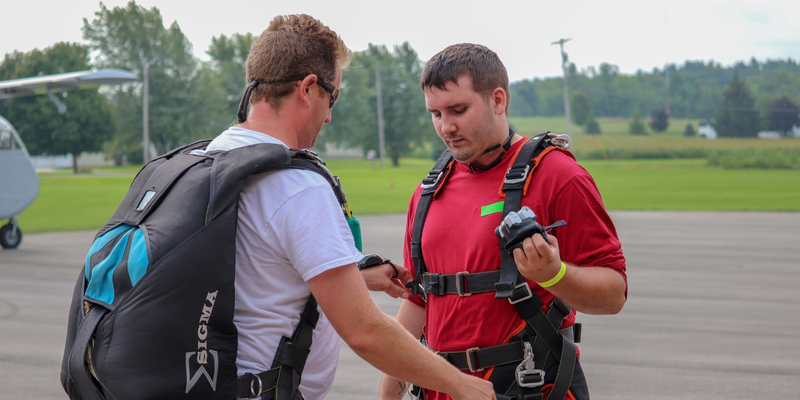 At WNY Skydiving we are committed to providing our students with an extensive skydiving training program. After completing this progression you will have earned your USPA “A” license. See below links for detailed section descriptions and associated costs. Following the successful completion of your Tandem Skydive Level 2, you are ready to move on to your First Jump Course! 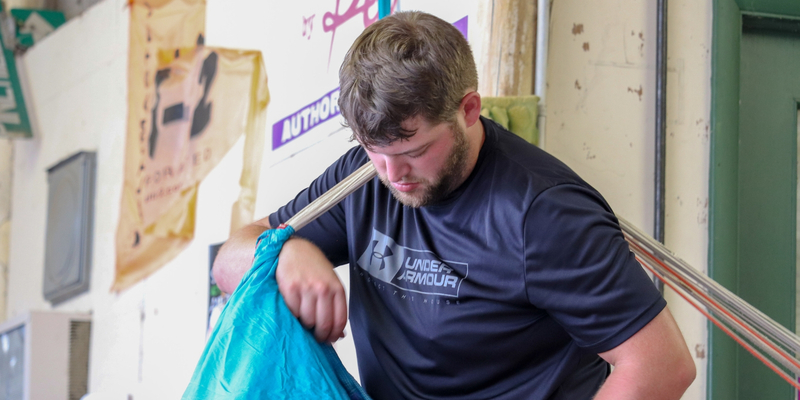 This is an 8-hour training, consisting of self-study, classroom, and physical demonstration / hands-on learning sections, and also includes a parachute packing class. Now you are ready to make that maiden jump with your own parachute! Through our comprehensive Accelerated Free Fall (AFF) Program, you will learn the fundamental life-saving skills every skydiver needs as well as a variety of in-air maneuvers and ultimately achieve solo flight. The final portion of your skydiving training leading to your “A” license – after the Tandem Skydive Level 2, First Jump Course and AFF Program – is the skydiving coach program. This section of your training program prepares you for more advanced free fall control. 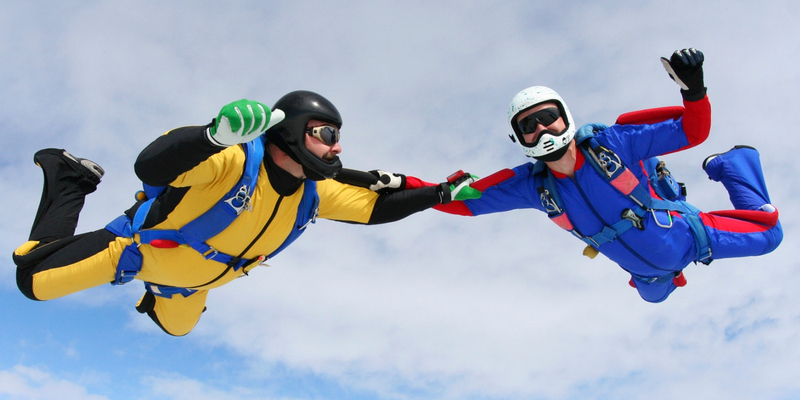 According to the USPA, “skydiving is a sport for individualists who like to do things together.” Your coach jumps will teach you the skills necessary to skydive with your friends. In addition to essential group freefall skills, your education in parachute flight will also continue. At the end of this program you will be ready to perform your “A” license check dive and will officially graduate from the student program. At this point you will be a licensed skydiver! Congrats! What is a Skydiving “A” License? The “A” license is the first license level you can achieve in skydiving. It is issued by the USPA and requires a minimum of 25 skydives, along with demonstration of several basic skydiving skills. The “A” license allows you to skydive almost anywhere in world. It allows you to jump in groups with other licensed skydivers. Once you have earned your “A” license, you no longer need to jump with a coach or instructor of any kind. Ready To Experience human flight? Call us to get started on a once-in-a-lifetime adventure!